Over the past years, the Defence Trade Unions have successfully played their roles as the legitimate representatives for the right and responsibility of Army civilian workers, creating favorable conditions for them to utilize their abilities in working, improving economy and consolidating the Army. At present, in order to meet ever higher requirements of consolidating the Army and protecting the Homeland, the Defence Trade Unions focus on building organizational structures. Under the leadership of the Central Military Commission, the Ministry of National Defence, and the General Department of Politics, the Defence Trade Unions have ever developed and promoted their role as the legitimate representatives of the Army civilian workers and the youth. Up to now, the Trade Unions, particularly at grassroots, have been strengthened with increasing number of Army civilian workers, better quality and skills, and more diversified jobs. Members of the Defence Trade Unions show their firm political wills, good ethics, strict observance to law and working disciplines, and successful mission accomplishment. In working and manufacturing, they have shown their creativeness, being master of science-technology, improving the quality and appearance of products, reducing the price. They have also made contribution to the enhancement of defence potentials and combat readiness. The above mentioned achievements are attributed to (i) the leadership of the party committees, the commissars, political cadres and commanders; (ii) the promotion of democratic principles at grassroots; (iii) the protection of legitimate rights and benefits; and (iv) the improvement of living standards and spiritual life for the Army civilians and workers. The movements of trade unions have closely linked with the Emulation movement, the Directive 05 CT/TW of the Politburo (12th tenure) on studying and following Ho Chi Minh’s ideology, ethics and style, and the movement of “promoting tradition, devoting talent, and deserving Uncle Ho’s soldiers”. As a result, the sense of awareness and responsibility of workers have been improved, making contribution to the consolidation of their units. Firstly, regularly conducting propaganda, education and training for Army civilian workers, and youth. 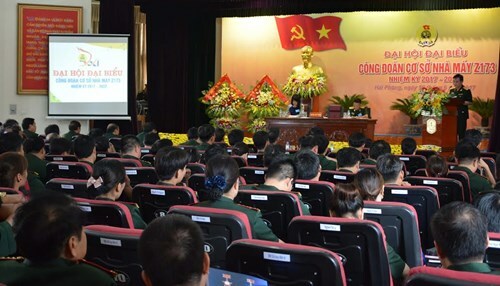 Thoroughly grasping resolutions and directives of upper party committees and commanders, the tasks of their units, trade unions have actively proposed ideas for party committees and commanders to renew forms and methods of education and propaganda; focusing on improving awareness of Army civilian workers and youth on building strong Viet Nam worker class and trade unions. The contents of the XII Party Congress’s Resolution, the action plan to implement the 6th Central Party Resolution (10th tenure) on “continuing to build Viet Nam worker class in the time of stepping up industrialization and modernization”; the XI Viet Nam Trade Union Congress’s Resolution; the action plan of the Viet Nam General Confederation of Labor, the annual plan on the Party work and political work of the General Department of Politics, etc. are on top agenda. On that basic, the Army civilians, workers and youth are trained on the Uncle Ho’s soldiers’ tradition, worker class ideology, the Army’s functions and tasks, the law, and the studying and following Ho Chi Minh’s ideology, ethics, and style. Continuing to renew and diversify methods of propaganda and education to make them relevant to each specific trainee group; focusing on direct talks and discussion; exploring and effectively using the Law bookshelf, creating favorable conditions for the youth and workers to read and understand law on working and producing. At the same time, paying attention to the improvement of cultural knowledge, professional ethics and skills, working style for the laborers; organizing supplementary classes, skillful workers contests, creative products and research, and movements on promoting initiative, innovating technology; resolutely fighting against manifestations of degradation on political ideology and ethics, violations of law and working disciplines. Secondly, improving the efficiency of emulation movements, creating motive force for Army civilians, workers and youth to fulfill their tasks. Accordingly, the trade unions should closely stick to their functions; political tasks of the units then launch emulation movements with specific contents and criteria, focusing on overcoming their weaknesses, improving skills and products’ quality and appearance. They should also attach their emulation movements with the studying and following Ho Chi Minh’s ideology, ethics, and style, the movement of “promoting tradition, devoting talent, and deserving Uncle Ho’s soldiers”. In conducting, trade unions at all levels should attach great importance to the work of summing up and withdrawing experiences, discovering, fostering and multiplying role models, and examples of “good people doing good deeds”, etc, creating actively competitive atmosphere in their units. Thirdly, renewing contents and methods of activities. The Defence Trade Union Board should strengthen the instructions in building and improving the quality of trade unions at grassroots in accordance with the Resolution 6a/NQ-TLD of the Steering Board of Viet Nam General Confederation of Labor (X tenure) on “renewing contents and methods and improving the quality of activities at grassroots trade unions”, the Directive 752/CT-CT of the General Department of Politics on “strengthening grassroots trade unions to meet the demands and tasks of the Army and develop defence industry in the time of national industrialization and modernization”. The Defence Trade Union Board has been active in studying and proposing the General Department of Politics to amend, supplement, and implement Principles on trade union activities in the Army in accordance with the regulations of the Party Secretariat, the regulations of the Trade Union, and the directive of the Viet Nam General Confederation of Labor; focusing on the fulfilment and enhancement of trade unions at all levels, particularly in Defence corporations; building strong and capable trade unions and trade unions’ cadres; effectively managing financial works. The grassroots trade union boards maintain the regular activities and principles, strengthening the supervision and examination, timely discovering and proposing solutions to overcome weaknesses. Fourthly, attaching importance to the management and social activities. The trade unions, particularly at grassroots levels should strictly implement the grassroots democracy; promoting their role as the board to protect rights and legitimate interests of laborers. The practice of grassroots democracy in corporations should strictly adhere to the Labor Code and the Law on Viet Nam Trade Union, as well as the Army’s regulations. Trade unions at all levels should be active in giving advices, coordinating with functioning agencies to organize the laborers meetings in corporations, the cadres and Army civilians meeting in departments and units; strengthening social activities and movements; supplementing funds for household economic development; promoting the implementation of “happy family-literal sense of soldiers” to assist army civilians and workers who are in difficulties. Fifthly, strengthening the leadership of party committees, cadres in charge and political departments toward the Defence Trade Union’s activities. The fact shows that wherever and whenever attentions are paid, then the trade union activities are effective. Therefore, annually, quarterly, and monthly, party committees should include trade union activities in their resolutions and assign cadres to directly observe and manage. Particularly, the trade unions’ cadres should be active and proactive in renewing working methods, helping the party committees and the commanders to direct and guide activities of the trade unions. By conducting above mentioned contents and solutions, the Defence Trade Union will be able to effectively promote their role and functions in practical activities, deserving the role as the core in persuading, mobilizing, and taking care of the rights and responsibilities of the Army civilians, workers and youth, making contribution to building comprehensively strong units and corporations, practically contributing to the 88 celebration of Viet Nam Trade Union (28/7/1929-28/7/2017.